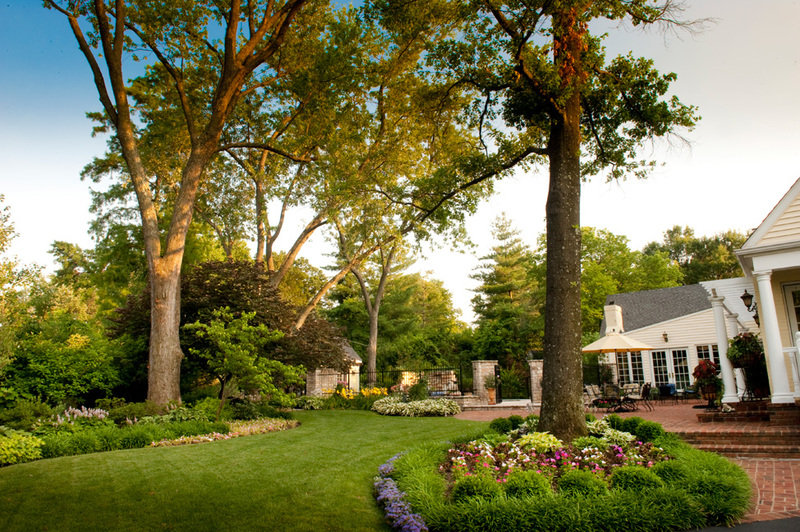 Frontenac homeowners create a quintessential English/American garden with a little dash of Missouri. After a stroll around the garden, a table and chairs by the koi pond is the perfect place to savor a glass of wine. A lush lawn panel-lined with redbud, serviceberry, boxwood, hosta, epimedium, liriope, daylily and seasonal colors sweeps toward the backyard pool area. 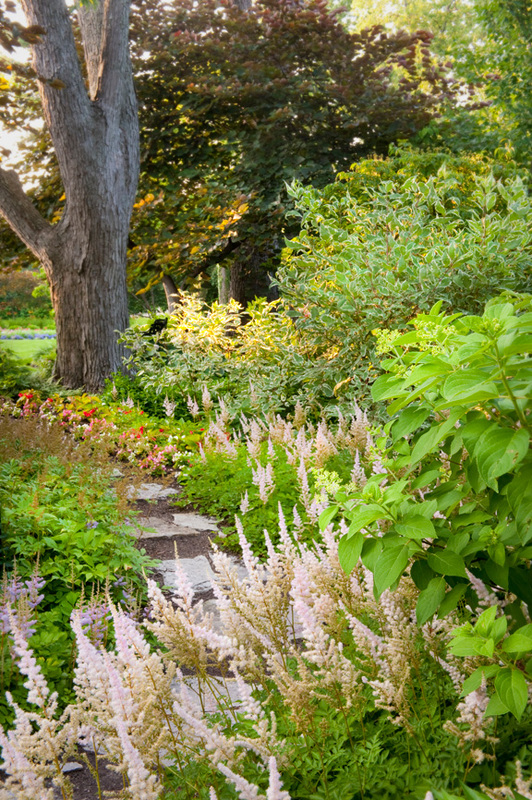 Feathery astilbe, variegated red twig dogwood, hydrangea, itea, hosta and seasonal color lead along a garden path. 'Hopi' Crape Myrtle, 'Quickfire' and 'All Summer Beauty' hydrangea, itea, daylily and seasonal color line a garden path to the pool. In the 18th century, British statesman Edmund Burke theorized that for men to love their country, their country should be lovely. Burke’s constituents in the British Isles took him at his word. In what has been called “the Golden Age of Gardening,” kings, queens and commoners alike had a passion for plants. As explorers roamed the oceans and investigated new lands, they brought home new specimens, seeds and bulbs, particularly for fruits and flowers. Gardens that had once been a collection of green hedges, accented with a few flowering native species, suddenly began overflowing with color. In Colonial Virginia plants from both the Old World and the New flourished in the gentle climate and gardens took on a uniquely American appearance. George Washington and Thomas Jefferson, in addition to being Founding Fathers, were amateur botanists and avid gardeners. English formality remained in neatly clipped hedges and geometric patterns, but those regular lines were softened by flowering vines, fruit bearing trees and flowers from around the world. Reproductions of these gardens can be seen at Mount Vernon, Monticello and in Colonial Williamsburg, where even small gardens beckon visitors with easy swinging entry gates, inviting archways and crushed shell or pink brick walks. Benches to sit, rest and enjoy are an important aspect of garden architecture. Growing up in Tidewater, Va., Debby Robins absorbed all these gardening principles. When she and her husband Steve purchased their Frontenac residence 22 years ago, no doubt attracted by the Colonial-style, story-and-half architecture, she began working to create around their home a quintessential English/American garden with a little dash of Missouri. “One of the first things I did was put a line of dogwoods and redbuds along the back of the property line because they reminded me of home,” Debby recalls. Happily both Virginia and Missouri share the dogwood as a state tree and her selections flourished. Her other visions were to have a different view of the garden from each window of her home and to create for her grandchildren “unexpected delights” in their grandmother’s garden. 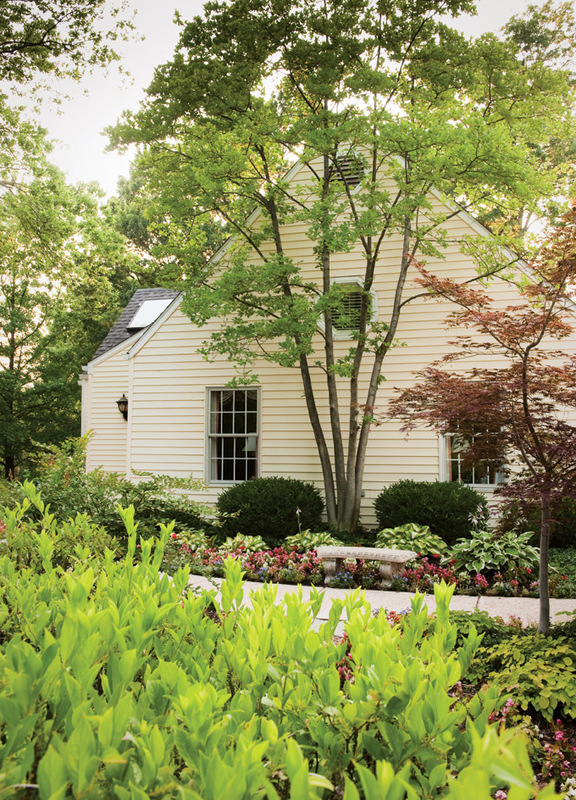 Both Debby and Steve actively planted the shady areas of their new garden with layers of hostas and feather-flowered astilbes in every color, along with traditional Virginia boxwoods. They also created a multifaceted sun garden with succulents, topiary and a koi pond. “We went to the (Missouri) Botanical Garden and researched plants that would attract birds and butterflies,” Debby explains. “We made sure to have seed so the birds came back every year, and we also had a water feature so they had something to drink in the summer. We’ve cultivated quite a flock of hummingbirds.” Little by little, they added a stone pathway so they could walk entirely around the house and go from area to area, visiting different types of gardens in each. In 2005, they made major renovations to both ends of their home and added a swimming pool, two-car garage and circular drive in front. 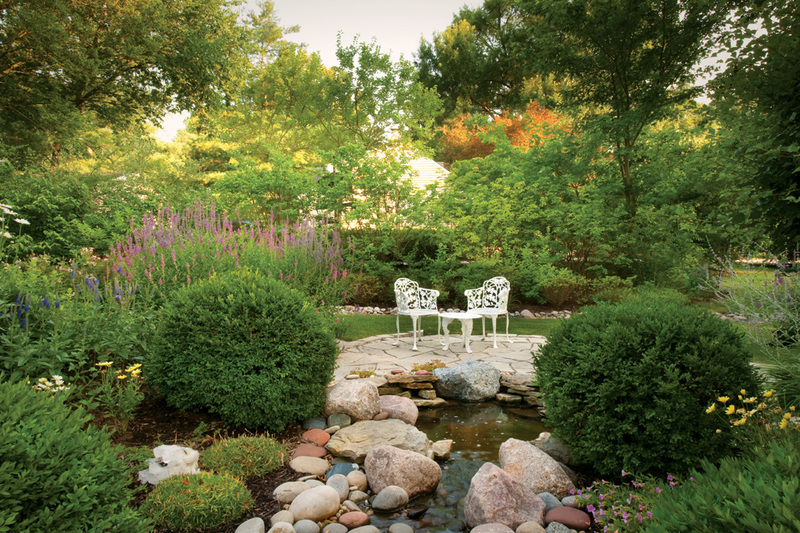 With many existing garden areas torn up and plants needing relocation, Debby decided to bring in professional help enlisting Ron Goedeker of Landscape St. Louis. "We entered the picture after the remodel had already devastated the landscape, so our goal and challenge was to help the Robins restore the grandeur of their gardens by working with the architecture of their home and listening closely to their vision," Ron says. Working together the Robins added layers of vegetation that would bloom in sequence beginning with azaleas and hydrangeas and using small flowering trees as a backdrop. Tidewater native Virginia sweetspire figures prominently in the new landscape for its lovely tassel-like early summer flowers, brilliant fall color and interesting branching in the winter landscape. “Ron introduced me to (Missouri native) red twig dogwood that adds so much color and interest to the landscape during the winter,” Debby notes. Charming colonial railings now accent the lovely brick walk that leads from the driveway to the front door of the Robins’s home. 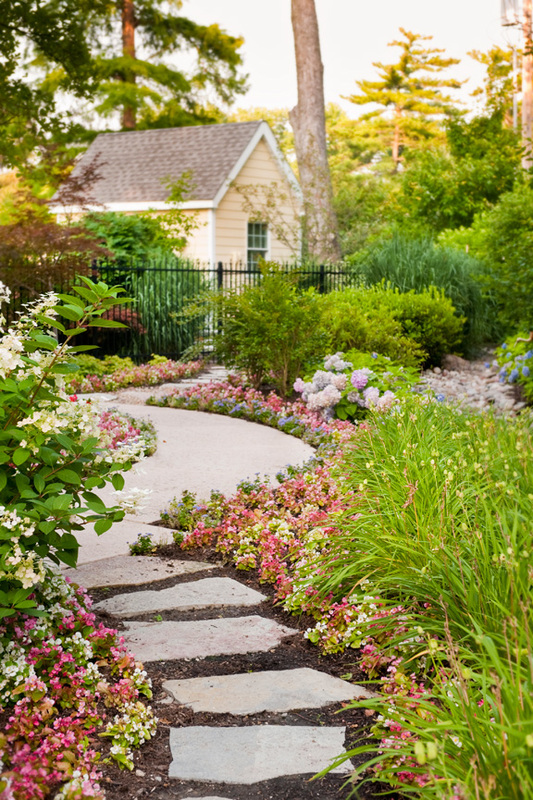 Flowers spill over the flagstone retaining walls that line the walkway and white benches invite visitors to stop, rest and take in the landscape. Color is everywhere thanks to an artful mix of perennials and annuals. Each window in the home has a picture perfect view. Truly appreciative of the gorgeous and welcoming English/American country garden that surrounds their home, Debby and Steve do take time to smell the flowers. They walk around their home via the garden pathway several times each day, Debby says. Two wrought iron chairs and a small table next to the koi pond provide the perfect spot for a glass of wine when the day is done. Debby is never far from her mission to create unexpected garden delights for her grandchildren. The koi pond is always a fascination. Several of the koi have become old friends. “In the winter I put wire mesh over the pond to catch the debris and place a pipe in the pond so air can get down to the bottom if the surface freezes and the koi are there the next summer,” Debby explains.